Actions allow you to perform various functions within SA. They may be dragged from the action menu into macros, or dragged directly to a hotbar. When creating a macro, the action menu automatically opens, but you may open the action menu independently by clicking Main Menu/Actions. The action menu is divided into categories which may be scrolled through using the left/right arrows. The available actions per category are shown below with some ‘sample’ hotbar sets using the action icons for example. Publish 86, September 2014 saw the introduction of a new default user interface. This brought additional action options, including several entirely new groups. These new actions are listed below in italic type. Some actions were moved to new lists, Two boat commands were removed. Samples of Action Icons dragged to hotbars. Fishing Navigator, multi directional, raise/drop anchor, turning around, fishing (still and moving) macros, fishing ‘items’ such as boat, rod, dagger, and ‘catch’ (fish and pearls), all displayed in a hotbar set. 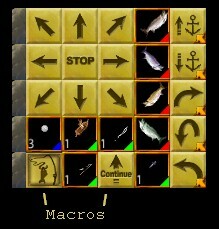 Using action/macro icons. Pet Control Action bar. (one click to ‘speak’ commands). It is very easy to set up a similar bar for all your house commands, banking commands, emotes such as as ‘smile’ ‘bow’ ‘claps’ etc. One click to perform the action/macro from the hotbar or assign to a hotkey.